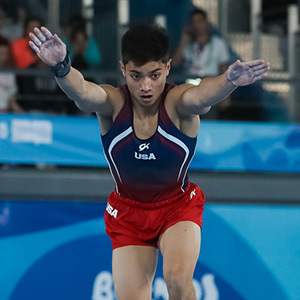 BUENOS AIRES, Argentina, Oct. 7, 2018 – Brandon Briones of Gilbert, Ariz./Aspire Kids Sports Center, qualified for the floor exercise final in men’s gymnastics all-around qualification round at the 2018 Youth Olympic Games in Buenos Aires, Argentina. Gymnastics’ qualification round continues tomorrow with men’s gymnastics, along with women’s trampoline and rhythmic gymnastics. Live scoring and results are available through the official website. The live stream of gymnastics coverage on the Olympic Channel begins on Oct. 11 with the men’s all-around finals. Alyssa Oh of Rocklin, Calif./World Elite Gymnastics, will compete in the session that begins at 2 p.m. Argentina time on Oct. 8, along with Briones on still rings. Men’s vault and trampoline are in the 7 p.m. Argentina time session. Rhythmic gymnast Elizabeth Kapitonova of Staten Island, N.Y./Isadora, takes to the floor for hoop at 2 p.m. on Oct. 9, local Argentina time. In the floor exercise qualification round, Briones claimed a 13.900 (4.700, difficulty; 9.200, execution), which put him first in the event’s preliminary ranking, and he will advance to the floor final. Russia’s Sergei Naidin was on Briones’ heels at 13.800. Great Britain’s Adam Tobin rounded out the top three in the rankings at 13.633. On the pommel horse, Briones posted a 12.633 (4.5, difficulty; 8.133, execution) for ninth place, and he is the first reserve for the pommel horse finals. Japan’s Takeru Kitazono scored the top qualification score at 14.133, followed by China’s Yin Dehang (13,866) and Naidin (13.666). After two of six events, Briones is ranked sixth in the all-around with a two-event total of 26.533. Kitazono has the top score of 27.633, followed by Naidin at 27.466 and Yin with 27.099. Acrobatic gymnastics and women’s floor exercise were also held today. The top three in the preliminary rankings were: women’s floor – Anastasiia Bachynska of Ukraine (13.300), Giorgia Villa of Italy (13.133), and Kseniia Klimenko of Russia (13.033); and acrobatic gymnastics – Ukraine (55.000), Israel (54.680) and Russia (54.390). Gymnastics begins with the multi-discipline event, which serves as the qualification round for the finals for each discipline. The Games will be broadcast on the Olympic Channel every night, beginning with the Opening Ceremony on Oct. 6. In addition, OlympicChannel.com and the Olympic Channel app will offer a 24/7 channel with live streams, replays and highlights.